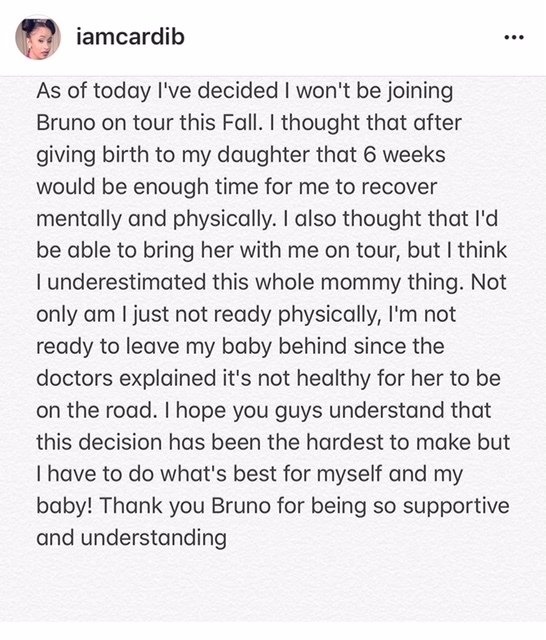 Family over everything wins in the end, as Cardi B. has decided to drop out of Bruno Mars’ World Tour. Cardi was slated to begin touring with Bruno Mars this fall, but the emcee has decided that being home with her baby girl Kulture is for the best. The “Bodak Yellow” singer announced the decision earlier today. Cardi welcomes baby Kulture on June 10. This announcement comes just 16 days after she gave birth. Posted on July 26, 2018, in ENTERTAINMENT NEWS. Bookmark the permalink. Leave a comment.